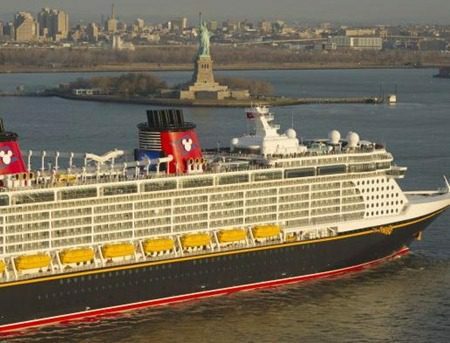 The Disney Fantasy, the newest ship in the Disney Cruise Line, arrived in the US today. Built in Germany, the ship sailed almost 4000 miles across the Atlantic before arriving today in New York City. Disney commissioned the ship in February of 2007. It is 1,120 feet long and will have 1250 state rooms. The Fantasy can carry up to 4000 passengers along with a staff of approximately 1450 cast and crew members. During it’s journey across the Atlantic, the crew have kept an online video blog which can be seen here. After the Fantasy’s christening in NYC, scheduled for March 1, the ship’s next stop will be its home port, Port Canaveral. Disney also has the Fantasy’s sister ship, the Disney Dream, sailing out of Port Canaveral. The Fantasy’s maiden cruise is set for March 31. It will take seven night cruises to the Caribbean and Castaway Cay, a private island owned by Disney. With the addition of the Fantasy, there will be a total of four ships in the Disney Cruise Line. In addition to the Fantasy and the Dream, there is also the Disney Magic and the Disney Wonder. The Magic has been cruising out of Port Canaveral, but with the arrival of the Fantasy, she is being moved to NYC (in May) from where she will cruise to the Bahamas. The Wonder has sailing off the west coast, and is currently based in Los Angeles. Last month Disney Cruise lines announced they would move the Wonder to Miami for five months, then return her to the west coast in the spring of 2013. The Disney Fantasy sailing past the Statue of Liberty, NYC.